It’s one of life’s eternal – and fantastic – truths that when you do something for the love of it you tend to excel. Our CEO Lawrence and his wife Gail have given their everything to UKFast over the last sixteen years and it’s made UKFast Campus an incredible place to work. 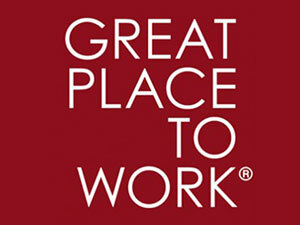 The team certainly thinks so, and – it appears – the people over at Great Place to Work agree! It also means that we’ve set the bar high, and we’ll continue to set it higher, so if you want to be part of something great then there could be a place here for you! We were absolutely made up to find out that we’ve achieved 5th place in the Great Place to Work’s Best 100 Medium Workplace list when it was announced last week. The rankings are decided on the back of surveys filled in by the team which makes it all the more special – the people on the ground have had the chance to have their say, and what they’re saying is pretty encouraging. We’ve been in Great Place to Work’s list for six years now and the awards always zero in on our unique way of doing things. Skiing trips to Verbier and team building in Snowdon, fancy dress fundraising days, a beach and ice rink in the car park, a gym and bar in the office (I could go on at length!) may seem mad to some businesses, but the health and wellbeing of the team has always been number one priority here. It’s also true that going against the grain can really pay off. A happy team means happier customers, and this, in turn, helps us on our mission to make Manchester Britain’s top tech city by creating awesome work environments to rival those of the big London firms. This award is a testimony to the hard work that Lawrence and Gail have put in over the years and to every single member of the UKFast team who all make working here what it is! If you think that our particular type of madness sounds like the right fit for you then get in touch. We’re going big on growing our team and we want to find 100 incredible people in all sorts of roles to ensure that UKFast is the best business it can be – and so that we can help the next generation of superstars find a home! Take a look at our careers page and see if you’re a future member of the UKFast family!